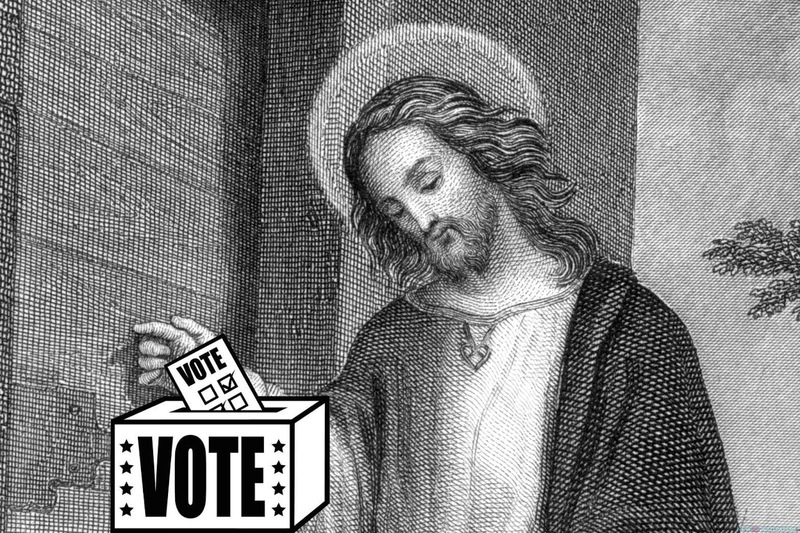 And Then Jesus Said: Get out and Vote! Is it appropriate for religious groups to use their tax-free dollars to lobby politicians and voters on either side of the aisle? With the 2018 midterm elections fast approaching, religious groups are working hard to boost voter turnout. With many House and Senate races expected to be tight contests, faith-based organizations on both sides of the political spectrum are hoping to convince people to get out and elect politicians who will serve their respective religious interests. 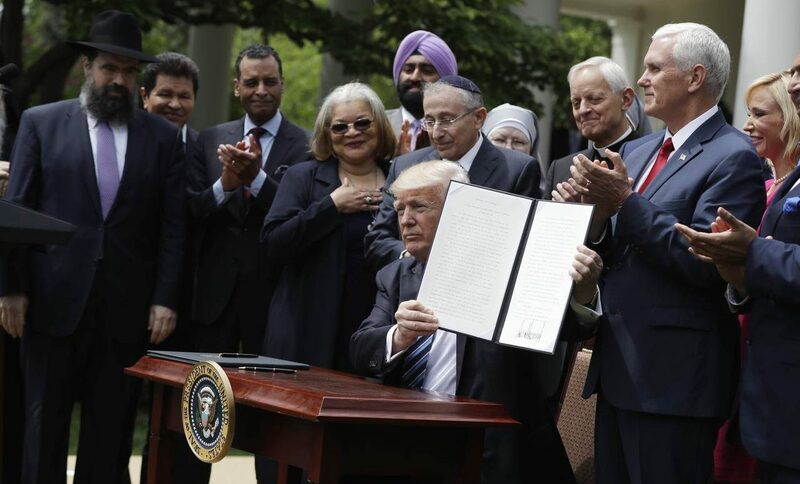 Roughly 81 percent of self-described white evangelicals supported Trump’s 2016 presidential bid – a figure well known to faith groups who are making considerable investments in an attempt to woo them. Leaders from conservative organizations such as the Faith & Freedom Coalition, the Family Policy Alliance and the Family Research Council are dishing out millions of dollars to fund voter turnout initiatives and political ad campaigns in key states and districts. Their goal? To counter a potential “Blue Wave” of Democratic resurgence at the polls this November. Pagitt claims that his group is “not reflexively partisan or reflexively Democrats,” but rather united by a common mission. “Our statement is that the Trump administration is a hazard to the wellbeing of a lot of people and to the planet and needs to be restrained. The common good calls us this election to respond with our vote,” he said. As political campaigning reaches a climax this month, money is flying around on both sides. The Faith & Freedom Coalition alone plans to spend roughly $18 million (nearly double what they did in 2016 and triple their 2014 spend) to target some 125 million social conservative voters across 19 different states through door-to-door interactions, digital ads and phone calls. The group has also partnered with 30,000 local churches to distribute voter education guides that will inform voters on where major party candidates stand on key social issues. At the same time, Democratic candidates have also received plenty of support from religious groups. 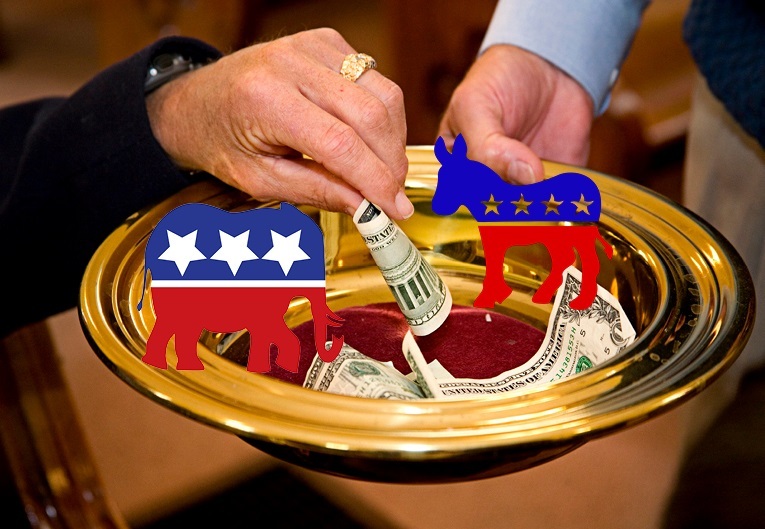 Most people assume that the majority of religious contributions go to Republicans, but according to OpenSecrets.org, dating back to 1990, 54 percent of individual religious contributions have gone to Democrats. During the 2014 election cycle, that number was even higher: 62 percent. But not everyone is comfortable with churches funneling money into politics. Whether right or left, progressive or conservative, is it appropriate for religious groups to use their tax-free dollars to lobby politicians and voters on either side of the aisle? Critics insist that religious groups should stay out of politics entirely. However, others argue that simply isn’t possible in this day and age. As evidence, they point out how politics has seeped into nearly every last facet of our daily lives – from Nike football ads igniting debates over patriotism, to religious groups clashing over sexual assault allegations on the Supreme Court. What do you think? Has it become impossible to separate faith and politics? Religion and politics should remain separate. Hoards of cash.This should be put to better uses. They should keep their opinions to themselves. Yes Barry I’m with you on this one all the way. And why are they tax free to start with? I think if you live in the USA and you make your money here no matter how you get that money you should pay taxes on it. What makes a church / ministry so special? I absolutely agree. In addition to combining politics with religion, all too many clergy have used the excuse of religious freedom to create tax shelters for themselves. Private Estates, Private Jets, Lavish Lifestyle. It is first and foremost a profit institution and it should be taxed and I would encourage all of us to seek out like minded legislatures. Several police men directing traffic.Good use of public funds. COPLAND AND CREFLO DOLLAR AND JOYCE MEYER should do the same. What they take in a month could feed a 3rd world nation for 20 years. And right here at home think about how many programs that money could fund. No more such thing as low income housing because people would no longer BE low income. Teachers c ould get paid way better than they do now. Police Fire and EMS departments could have the top of the line equipment . I agree with you completly. Those mega churches have incomes that could drawf several state budgets ! We will not have a true democracy while we have this current Supreme Court. Simple as that. Paul, America is a Republic, not a democratic government. Jesus teaches that we are to flee from evil. He says we are not to resist evil. It is very obvious that American politics are evil. So I feel very comfortable keeping a hands free approach when it comes to politics of which the Supreme Court is a byproduct. Would we have a true democracy if the Supreme Court was diffrent? From your inference I think what your saying is if the Supreme Court was more liberal we’d have a better democracy. Totally agree with you, Barry. Well said. Were it not for the partisan role black Christian churches played in the civil rights era (and beyond) we would still likely be living in a semi-segregated society. Must churches now give up that role when there are so many other moral issues that must be faced? Morality IS a churches business, like it or not. I agree. But, which moral issues are at stake within a religioeus political arena? Certainly those basic teachings of the Commandments to the congregation is important as it let’s the those being taught to teach the same to their children. The person standing on the dias should not preach that one person, or side, is bad, corrupt, cheating, or anything else, just because of their personal feelings. One must remember that in many instances the audience is looking to the speaker as being an “expert” on religion, which is God, therefore what’s being spoken must be true or God wouldn’t have put those thoughts in his head and, consequently, the words in his mouth to share. In what universe did some naive politician decide on a separation of church (religion) and state? And expected this to be so? A country and it’s political system is made up of people, and people have ideas and religions, etc. All people, not just Joe every man, but also leaders. So of course religion is going to matter in politics, and it’s monetary support! Wait until the Hindu, or Muslim voters and business men start their own super pac, they may already have done so but because of perception we may not be aware? Any way you slice it, religion and all other org’s with money will affect the outcome! NO MY MINISTRY IS NOT TAX FREE, I NEVER FILED FOR A TAX NUMBER. What ever money, if any, I receive from donations I will be happt to pay taxes on. so far that hasn’t been enough to talk about, but should it some day total real money I feel if I made that money here in America then i should pay taxes on it like everyone else. As an INDEPENDENT Ministry I recevie no aid from ULC to help with expences . The every day costs to run this Ministry I pick up myself. And I STILL will be willing to pay taxes. So what’s these other minister’s problem? Churches receive the same amount of infrastructure (roads and utilities) and police/fire/ambulance protection as any other business. The government should not be able to TELL if something is a church or a store by way it taxes it. Income tax deductions should be allowed to a church, like any other organization, for charitable work. If the church is running a homeless shelter, soup kitchen, or something that helps others, that should be deductable. If the church is running itself – and in the case of disaster closes its doors and will not allow disaster refugees to shelter there, no, it’s not a charity. It’s a private club, and should not be treated any different than a members-only bar. As far as favoritism, if someone feels that their tax-valuation is too high, whether an individual or a business, they can file a protest with the county or municipal government, and state their case as to why they don’t think their property is worth that much – usually the evidence is what similar properties in the area have recently sold for. Favoritism happens now with individuals and businesses. It’s handled. Chuches would be no different. You, gentle lady, have summarized my feelings exactly! What’s the difference their already, in many onstances, already 100% politically involved. No…Separate church and state. Churches should put their money in helping their neighborhood..crime..feeding the poor..Not paying lobbists!!! Agree ! Put their $Cash into cities and towns and we could all have better lives.Lower taxes too. Ok good point, so how about if they pay STATE taxes that pays for more cops on the street and better education for the children in that state. What do you think about something like that? As a strong believer in the separation of church and state, I am in favor of all religious denominations having to pay taxes. Religious organizations are beneficiaries of police, fire, and public roadways. Those services need to be paid. Biblical scriptures (Leviticus in particular) provide specific guidance regarding tithes to support religious activities. Likewise, governments have established taxation to cover expenses related to national defense and providing for the common good of the population. Both of these requirements can coexist. Their are many that claim the foundation of our country was based on the need for religious freedom. May I humbly remind, that it is equally true that freedom from religion is also to be considered. I support religious activities that encourage members to become informed voters and to exercise their right to vote. I do not support religious activities that dictate how or to which candidate they should cast their vote. In accordance with ULC doctrine; Do That Which Is Right. I’m not sure what you mean by “becoming informed voters.” Does that mean to be informed with the same political ideology that is being taught by the church? In response to Tuk’s question on October 20th, 2018 at 1:36 am. Swaggert has his own 24/7 network now. Every month they have the nerve to beg people for money to keep it on the air. They then waste good air time telling you John from Ohio 100 dollars Mary from New Jersey 50 dollars. Nobody needs to or wants to know this. And he gets these people to donate MILLIONS. All of it TAX FREE MONEY. And has anyone ever seen the ministry’s books? Just how much of that money really goes to the ministry. On top of this he offers CDs DVDs and several Bibles none of them free, so that draws him even more money..
One tenth, the amount most churches ask us to give of our income, in his case would total enough money to pay off the national debth. So maybe Trump should give up on this wall thing and start a new mission…revolk this free ride churches and other charities have been getting for way too long. You know, years ago I was with a radio communications club. Every year we held a fun raiser event and gave every dime we made from it to charity. Unit we found out the director of the charity we picked to donate to used our money to buy herself a brand new Caddy. This was one of thoses charities that helped crippled children, or at least Said they did. Not a true honest chariry but yet Tax free. So my point is this, I feel noone should be getting a tax break. The rich, the Middle Class all should pay to support the country that they make their money in. People on Social Security alread paid the years they worked so no they shouldn’t have to pay now. Let’s make America great again, thst’s Trumps line. Well we need money to do that. Here’s a way to get that money without having to raise the amount of tax money we pay now. And who knows maybe we can one day see things like free health care and free education for every American. I say Swaggert should send every viewer a 1,000 dollars and then let his ministry reap the blessings he promises others if they give. Why is he always needing money? Cost money to eat and dress well. He is not having hamburger helper that’s for sure. Evangelicals are laughing all the way to the bank, but then again, they wouldn’t be doing that if parishioners weren’t so amazingly gullible. T D bank was owned by the Bishop. He has so much money he opened his own bank to keep it in. Unfortunately the terms “politician” and “priest” are mostly synonymous. They both attempt to manipulate the masses into claiming that they are the ONLY one with the “right” agenda, so they can basically extort their followers time, money, and emotional capital. Church and state should remain separate EXCEPT for the state’s protection in allowing for equality of status for ALL churches. But that’s like asking Republicans and Democrats to be more reasonable in reaching compromises for the good of ALL the people. American democracy is SUPPOSED to be about reaching balanced and fair compromises between all of the diverse communities that make up the nation. Though the individual religious groups shouldn’t have to compromise their respective doctrines, they should be required to respect the diversity of the democratic process by NOT attempting to dominate the political agendas. But when the current political system is so dysfunctional it’s no surprise when politicians “preach” and preachers become political – all for THEIR self-serving gain and NOT as a service to the people. Daniel, that is a well thought-out comment expressed logically and reasonably. So stand by for the inevitable attack of those who support politicians or priests. Daniel, I could not agree more. I saw this quote yesterday. 1. Ministers who tell you how to vote. 2. Politicians who tell you how to pray. BTW, before voting read Ezekiel 16:49. And don’t forget to read Harry Potter. That’s also a great mythological story. Voting is the right of an adult citizen and has nothing to do with religious rights. I believe that there absolutely must be a separation of church and state. When politics gets involved in religion, it only serves to alienate people from societies where the predominant religion holds the majority of political power. This alienation leads to distrust, frustration, anger and eventually violence. Each person must be allowed the freedom to make their own choices in life, whether they’re about faith or politics, or anything else for that matter. Churches shouldn’t influence their parishioners about politics any more than politicians should influence what faith they should follow. Churches should be tending to the ministry of their members and letting them exercise their own free will in the voting booth. If a person has a strong foundation of faith, then that will be reflected in the ballot box without any help from the pulpit. If they don’t, then it’s more than likely that no amount of pulpit politics will make a difference in whether or not they vote one way or another, or if they vote at all. If you really want to change the political landscape, start with love and acceptance. Opening hearts will lead to opening minds. Love is the answer. Pray for peace. I believe responsible people should vote responsibly. If a person subscribes to a particular philosophy, they should allow their politics to be informed by that philosophy and vote accordingly. Prepare for a red tsunami. Religion and politics will be discussed everywhere there are two people, eventually. Why were they separated in our Constitution. Read a bit of history before commenting. Oppression, pure and simple. Our system of governance is excellent. I do believe that the Electoral College has outlived it’s original intent and should be reviewed closely. I also believe in majority rule. So, all voters must vote. If any of us are encouraging anything beyond VOTE, from our position of influence, then shame on us. It’s high time we were Americans, then far behind that comes the party or dogma. We need to squelch the rampant and obviously dangerous divisiveness. I was first to vote at my polling place this morning. Here in Connecticut Im not so sure we are going to make out better when all this election is over. I don’t see how any of the people running for office will make Connecticut a better state.